It’s not what it sounds like. The Rasterbator is a program that creates huge rasterized images from any picture. It expands the picture and breaks it down into 8.5″ x 11″ pages that are printable from your own printer. 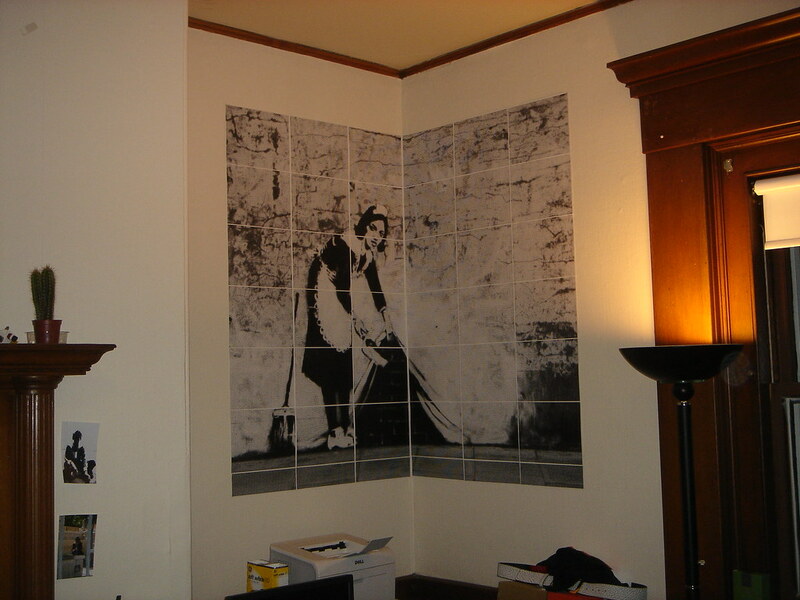 A couple years ago, I took Banksy’s “Chalk Farm Maid” and turned it into a giant poster for my room (pictured above). The Rasterbator is a really cool way to make giant art that would normally break the bank at Kinko’s or a poster store for pennies on the dollar. You can also get creative with the images, put them on your ceiling, wallpaper your room, have the images interact with things in your room, etc. In summation, the Rasterbator is the perfect solution to make your room awesome if you a.) can’t afford posters and/or b.) are sick of the stock, overused posters plastered in seemingly every college dorm. More pictures of creative Rasterbator uses and a disclaimer after the fold.